Above: Garrison Hall, just before it was opened in 1926. This year, Garrison Hall is 90 years old. Nestled in the southeast corner of the Main Mall, peeking out from behind a canopy of live oaks, the building is often overlooked in favor of its better-known neighbors, Battle Hall and the UT Tower. But Garrison Hall is an architectural gem with a distinctive history, a treasure on the campus for those who take the time to explore it. 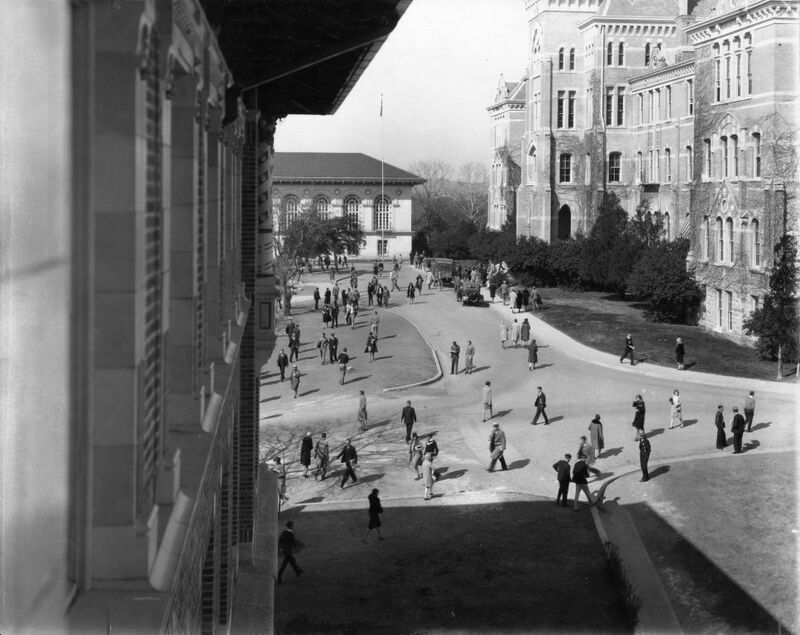 Above: The University of Texas campus from University Avenue, circa 1920. 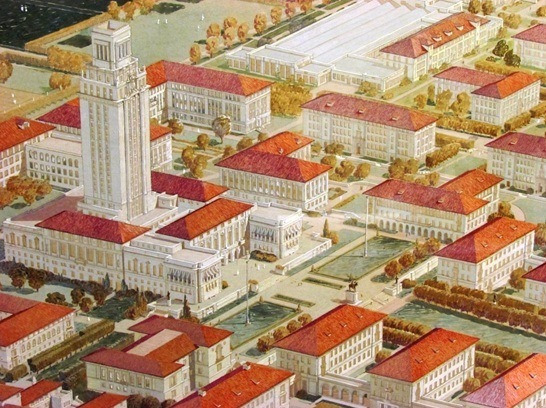 In 1921, a crowded and growing University of Texas first acquired land beyond its original forty acres. A bill passed by the Texas Legislature and signed by Governor Pat Neff purchased property to the east and southeast. The campus tripled in size, and extended past Waller Creek. The following year, the Board of Regents appointed Herbert Greene of Dallas as the University Architect. 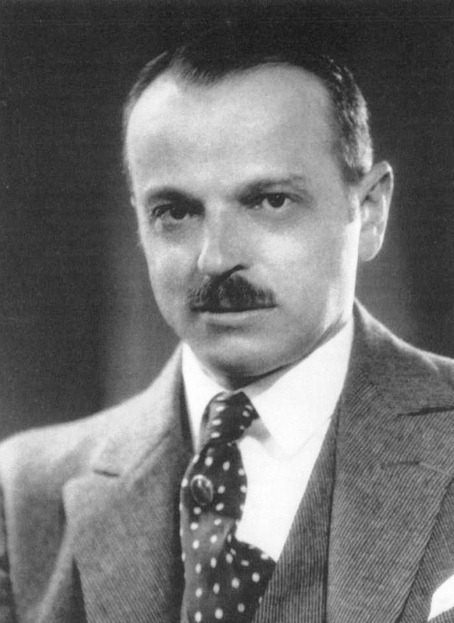 Greene succeeded Cass Gilbert, who had designed Battle and Sutton Halls, but because he was based in New York City, was a victim of mounting political pressure to have an in-state architect for the University. Greene was highly respected as a building designer, but his experience in campus planning was limited. In 1923, the regents recruited James White, an architecture professor at the University of Illinois, as the consulting architect who would provide an overall campus master plan. White submitted his first campus scheme in fall of 1924. Eager to take advantage of the long, gently sloping hill that extended east into the new portion of the campus, White proposed a significant re-orientation of the campus, to face east instead of south toward downtown Austin, and designed a single mall, 175 feet wide, that connected the crest of the hill at the center of the Forty Acres – where the old Main Building stood and where the Tower is today – with Waller Creek at the bottom of the slope. Campus structures were arranged in a series of concentric rings that spread outward from the hilltop. 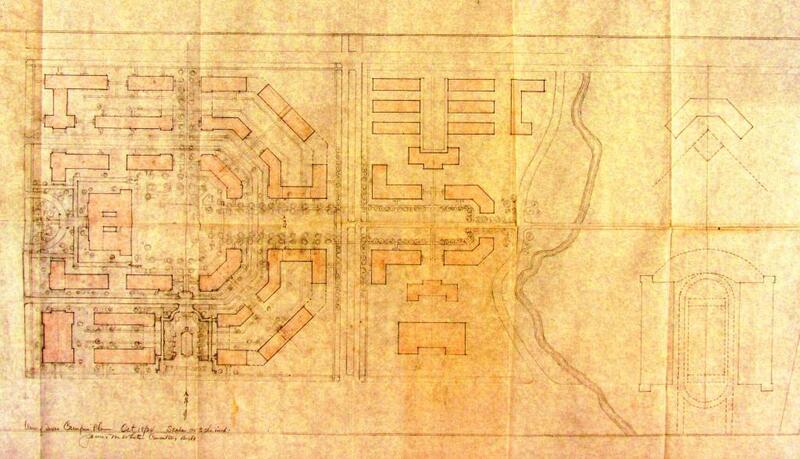 Above: John White’s 1924 campus master plan, which would have emphasized an east-west orientation. On the left, Battle Hall would have been enlarged and become the focus of a large square, while a broad East Mall would have continued down the hill to the right toward Waller Creek. The football stadium is at the bottom right. 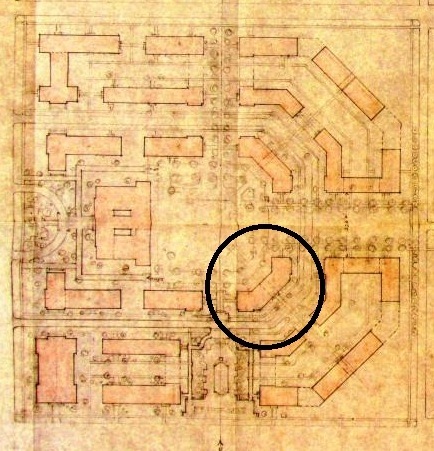 Below: The future position of Garrison Hall is circled. It was changed to an L-shaped building to help define the edge of the central square and the East Mall. Click on an image for a larger version. White envisioned the University Library (today’s Battle Hall) as the focus of the campus, removed the Old Main Building entirely, and replaced it with a large square plaza, 450 feet long on each side. The library was to be enlarged so that its façade was roughly three times the length of the original building, and would be centered on the plaza’s west side. Across the plaza on the east end, two buildings were planted as part of the first concentric ring and also intended to visually define the width of the mall. Surprisingly, the Faculty Building Committee, the University President and the Board of Regents all approved this radical new design, with a few important alterations. The two buildings immediately to the east of the central plaza, instead of being part of a circle, were retooled as L-shaped structures. One was to be placed near the southeast corner of the plaza and face the library; its north-south wing would define the limit of the plaza, while it east-west wing would define the boundary of the mall. As its counterpart, another L-shaped building was intended to be near the northeast corner of the plaza. Once White’s campus plan was ratified, the regents declared a new classroom building (and a new home for the history department) its top priority, and directed the building planned for the southeast corner of the plaza to be constructed first. 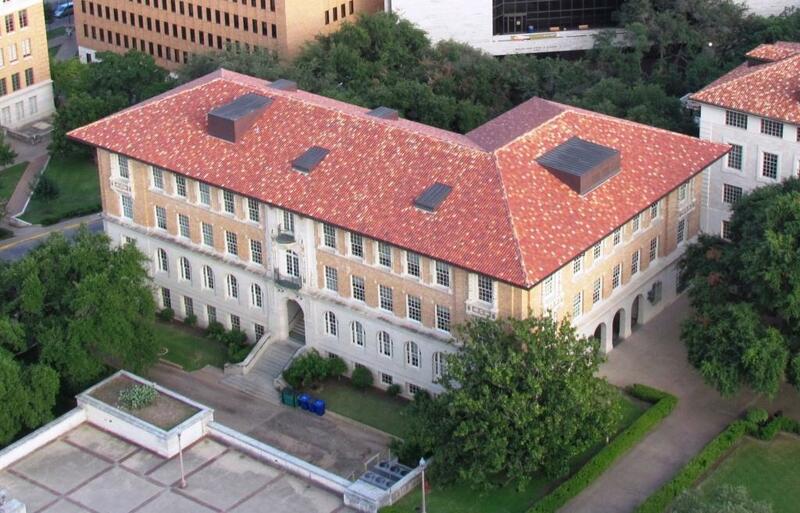 Above: Garrison Hall seen from the UT Tower observation deck. Almost immediately, though, the administration began to have second thoughts. William Battle, Chair of the Faculty Building Committee, wrote to White, “The University has been facing Austin and the Capitol so long that it would not be easy to abandon this front even if it were thought desirable.” Within a year, the regents concurred, rescinded their decision, and asked White to try again. But the process for the new structure was well underway, and rather than wait for a new scheme, construction was allowed to continue. The building’s odd placement – it doesn’t line up with the entrance to Battle Hall or the flagpoles on the Main Mall – would be an issue for future campus planners. 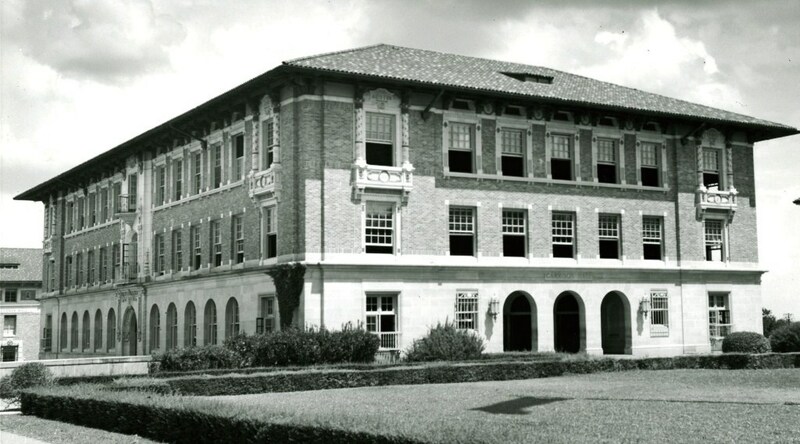 Opened in 1926 at a cost of $370,000, Garrison Hall was host to a collage of academic departments; English, government, psychology, sociology, philosophy, economics and history initially shared the facility, though the building was really always intended for history, and the other departments have since found lodgings elsewhere on campus. The building’s namesake, George P. Garrison, joined the University faculty in 1884, served as the first chair of the history department, and was a founding member of the Texas State Historical Association. Above: The 1920s view of the campus from the north side of Garrison Hall. Old Main is on the right, with the library (Battle Hall) across the mall. Click on image for a larger version. 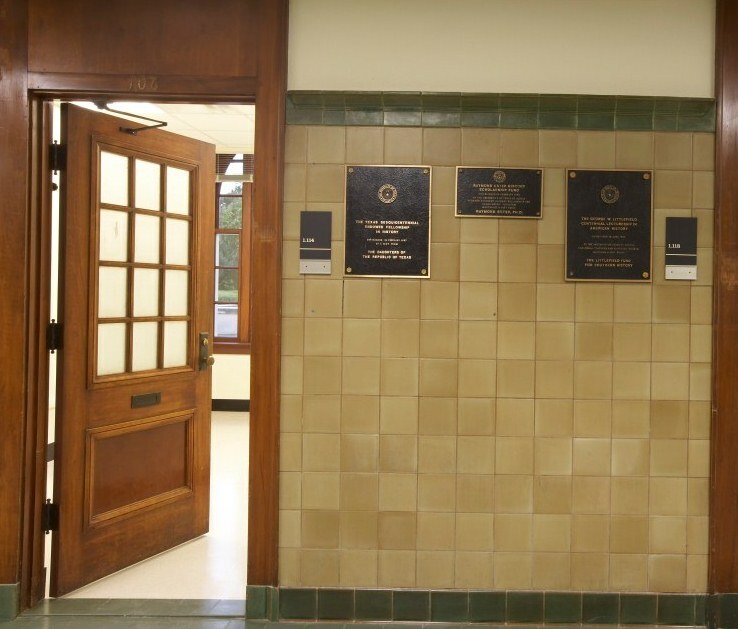 The cornerstone, as with the cornerstones of most of the buildings on the Forty Acres, is hollow, something like a permanently sealed time capsule. Among the objects placed inside: a 1925 Cactus yearbook; a catalog, course schedule, and student directory for the 1925-26 academic year; an alumni directory, copies of The Daily Texan; a souvenir “Book of Views” of the University; a source book on the history of Texas; and articles and letters authored by George Garrison. 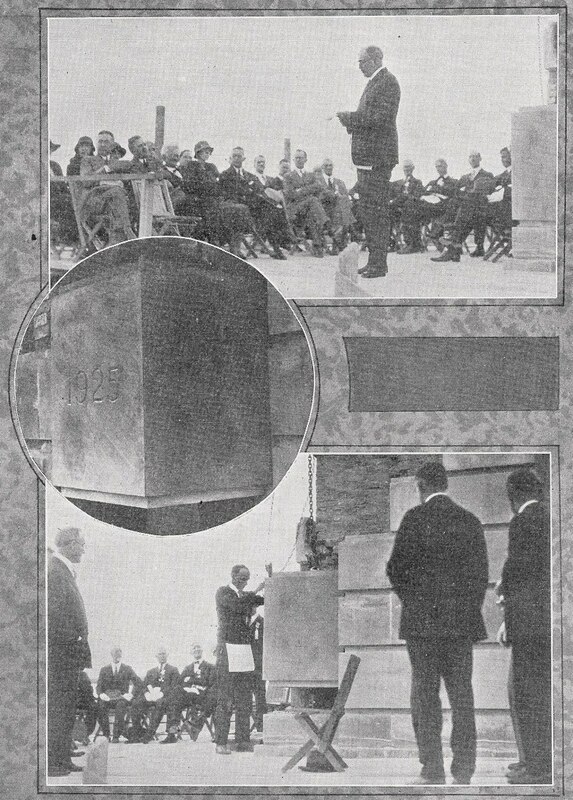 Right: Images from the cornerstone ceremony in December 1925. Along with its unusual location, Garrison’s ornamentation also represented a departure from earlier UT buildings. Classical icons adorn architect Cass Gilbert’s Battle and Sutton Halls. Owls, an ancient symbol of Athena, the Goddess of Wisdom, were placed under the eaves of Battle Hall, while Sutton Hall was decorated with scallop shells, emblematic of Venus, the Goddess of Truth and Beauty. Garrison Hall continued the same Mediterranean motif of Gilbert’s designs, constructed of Lauder limestone quarried from France, multi-colored bricks similar to Sutton Hall, and a red-tile roof imported from Spain. 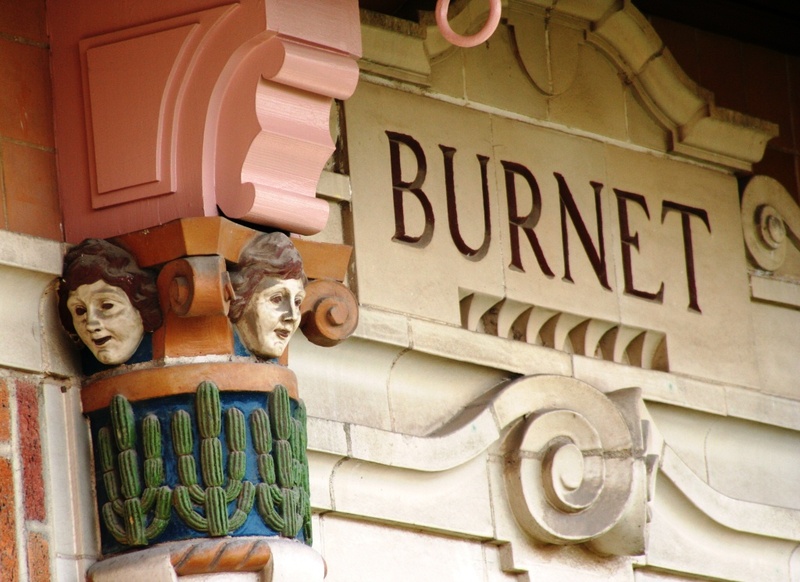 Its ornamentation, though, is unmistakably “Texan.” Limestone carvings of longhorn skulls, along with terra-cotta cacti and bluebonnets decorate the entrances. Imprinted below the eaves and corner windows are the names of founders of the Republic of Texas, among them: Houston, Austin, Burnet, Jones, Travis, and Lamar. Above: The names of the founders of the Republic of Texas appear on the building, along with 32 cattle brands. Here is the “W” of the King Ranch. Most striking are the 32 terra-cotta cattle brands, carefully chosen among hundreds of candidates, to represent various periods of the cattle industry in the State of Texas. 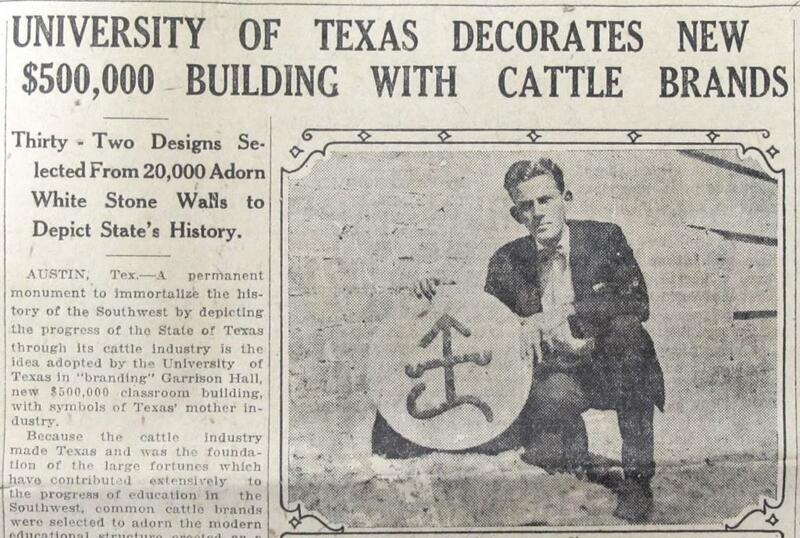 Garrison Hall is the only college building anywhere to have cattle brands on its outer walls. The unusual choice received national press while the building was under construction. 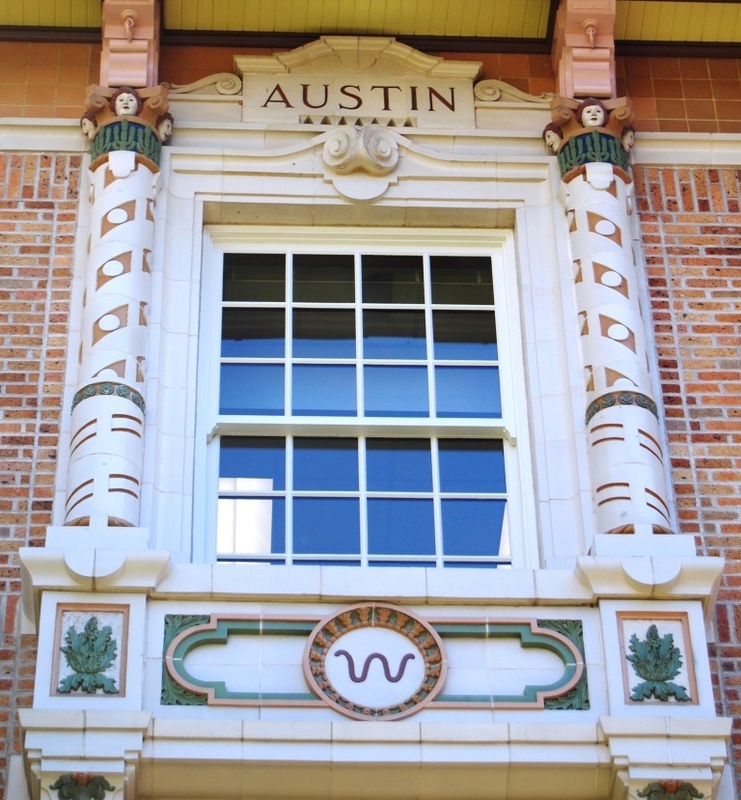 Above: The inclusion of terra-cotta cattle brands on a college building to mark the history of the Texas cattle industry received national press. This is a clipping from the Saint Louis Times-Dispatch. The idea came from Dr. William Battle, then chair of the Faculty Building Committee. Though he was, ironically, a professor of Greek and Classical Civilization, Battle claimed not to be “stuck on” classical icons for UT buildings, and suggested the use of images that pertained to the academic departments housed inside them. Inside, more than 3,500 square feet of linoleum tile was used in the extra-wide hallways. Greene advocated using “battleship green,” but Battle was concerned that the color wouldn’t hide the dirt, scuffing, and general wear as well, and preferred brown. In the end, a compromise was reached, and both colors were used. Rooms were equipped with ceiling fans, and a modern water cooling system was installed for the drinking fountains to make the un-air conditioned building bearable in the warmer months. I noticed that the north entrance to Garrison Hall is a harboring place for bats. It is evident to the senses of both sight and smell. Thanks for your letter about bats. I do not see how to protect entrances from these loathsome creatures, but Miss Gearing tells me that the Comptroller’s office has an excellent way of dealing with them. It is apparently by using fire extinguishing apparatus. Paul Cret (photo at right), appointed in 1930 to replace James White as consulting architect, developed his own campus master plan, which included the Main Building and Tower, and attempted to resolve the issue of Garrison Hall’s placement. Born in Lyon, France and trained at the Ecole des Beaux-Arts in Paris, Cret has immigrated to the United States and oversaw the architecture school at the University of Pennsylvania when he was hired by UT. With an emphasis of straight lines and balanced masses, he placed the flagpoles on the Main Mall to line up with the entrance of Battle Hall. To anticipate future growth, Cret suggested adding wings to existing structures, rather than construct new buildings in open areas that might disturb the layout of the campus. Garrison Hall was included in the idea. Though not implemented (at least, not yet), Cret envisioned a north wing to Garrison Hall that would allow its main entrance to be re-positioned where it would still be in the center of the front façade, and also line up with Battle Hall. Above: A bird’s eye view of Paul Cret’s campus plan, with a close-up of the Main Mall. To plan ahead for growth, Cret advocated adding wings to the W.C. Hogg Building and Garrison Hall. This wouldn’t disturb the overall plan – actually, it better defined the start of the East Mall – but the wing to Garrison would also allow the front door to be moved to the north and centered with Battle Hall and the flag poles. Below: A closer look at the W. C. Hogg Building on the left with a wing extending south, and Garrison Hall on the right with an addition to the north and its front entrance relocated. This entry was posted in Uncategorized and tagged Cass Gilbert, Cattle brand, Garrison Hall, Goldwin Goldsmith, Herbert Greene, history department, Jim Nicar, John White, Paul Cret, William Battle by jimnicar. Bookmark the permalink.